With the XBOOK, there’s no such thing as “out of office.” This 2.4lb rugged tablet-based “mobile office” doesn’t know the difference between inside and outside, laptop or desktop. This powerful 2-in-1 mobile computer can literally be anything you need: a desktop for your office, a full vehicle-mounted notebook, or an easily transportable tablet with a spill-resistant detachable keyboard that tags along in your bag until you are ready to use it. It has a sunlight viewable 10” touch and pen input display that can handle whatever you throw at it. It also powers through vibration and immediately shakes off those bound-to-happen drops onto concrete or into puddles. Indeed, this lightweight laptop replacement is built for traveling, whether you take frequent trips into a storage freezer or onto an oil rig platform for inspections. In other words, the XBOOK is the only computer you need to power through your entire to-do list without delay or multiple device syncs, no matter where your “office” may be in that moment. The Xplore XBOOK™ D10 is more than a rugged 2-in-1 tablet. And, Android is more than just a “mobile” OS. Together, they give you a complete mobile office that is perfect whether your “office” is inside, behind a desk; in the field, on foot; or on the move at the helm of a forklift, plane, train or automobile. The XBOOK D10 boasts powerful processing capabilities, multiple data entry options, and fully rugged tablet design that will protect your entire IT investment. Even better, the ultra-flexible 2-in-1 protects your workers’ time and improves your company’s productivity levels. Android doesn’t have to only be a mobile OS. With the XBOOK D10, Android can be the only OS you need to get real work done. 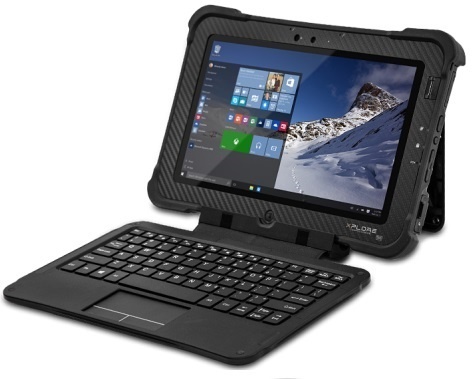 Simply attach the full tactile spill-resistant keyboard to the fully rugged 2-in-1 tablet to gain a fully-featured laptop/desktop computer that boasts an Intel® x86 Atom-series core processor; the professional-grade Android OS; 4GB RAM; 64GB SSD and a 3-year limited warranty. The transformational MIL-STD-810G certified and IP65 rated 2-in-1 also survives the harshest drops, most extreme temperatures and constant vibration . Best of all, with a 10.1” outdoor-viewable display, the XBOOK D10 is ready for any job under the sun. Work from more than one “office”? The multi-touch XBOOK D10 will keep you connected to the software, peripherals, and back-office business systems essential to performing your job, without compromise. It is the ideal mobile computing platform – and laptop replacement – for nearly every field, industrial, and in-vehicle workflow. It is also the easiest, and most cost-effective, way to achieve complete Android-based business mobility in a 10” form factor. This physically resilient Android computer is easily managed and built to excel at least 3-5 years. In fact, it’s the XBOOK D10’s long-lasting platform stability, easy software and feature scalability, and extensive security capabilities that make it so appealing to business leaders. It doesn’t matter where or how you prefer to work. The ruggedly appealing Xplore XBOOK™ B10 is a powerful 2-in-1 mobile computer that can be a laptop for your office desk, a full vehicle-mounted tablet, or an easily transportable tablet with a spill-resistant detachable keyboard that tags along in your bag until you are ready to use it. The award-winning laptop replacement comes standard with a sunlight viewable 10.1” touch and pen input display that can handle whatever you throw at it, or accidentally drop it into (i.e. puddles) and onto (i.e. the ground 5’ below). This tablet-based mobile office is also ready for frequent trips into a storage freezer if that’s how you spend your days. In other words, the Windowsbased XBOOK B10 is the only computer you need to power through every task, no matter where your “office” may be in that moment. It is also the easiest, and most cost-effective, way to achieve complete business mobility in a 10” Windows-based form factor. The XBOOK B10 is known for its powerful processing capabilities, multiple data entry options, and fully rugged tablet protection – and that will never change. Simply attach the full tactile spill-resistant keyboard to the tablet and you’ll immediately gain a fully-featured laptop/desktop computer for a “work anywhere” experience. Mobile workers choose the XBOOK B10 2-in-1 computer for its lightweight mobility, industry-leading number of I/O and reliable wireless network connectivity. Yet, they benefit most from its long-lasting platform stability, easy software and feature scalability, and extensive security capabilities. This MIL-STD-810G certified and IP65 rated detachable tablet not only survives the harshest drops, most extreme temperatures and constant vibration while exposed to extreme environmental elements, it is also very much in its element as a traditional desktop in your office1. And best of all, you won’t need to buy another tablet, laptop or desktop for a while. The XBOOK B10 is driven by powerful Intel® Core™-Series Processors and genuine, professional-grade Windows® 10. It also gives you I/O compatibility with both legacy and future peripheral technologies. In other words, the easily managed, always upgradeable, physically resilient XBOOK B10 won’t show its age IT’S LIKE YOU NEVER LEFT THE OFFICE when you’re still using it 3-5 years from now.